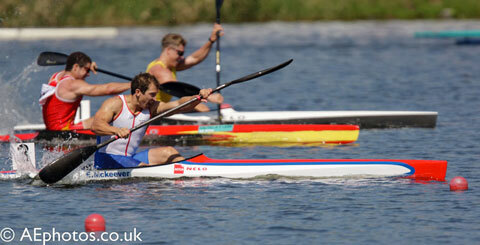 Sprint Racing: Ed McKeever is a British kayak sprint athlete and a current World and European Champion. Sprint Racing and Canoe Slalom are the only two canoeing events included in the Olympic Games. In Sprint Racing the competitors race on flat water over distances of 200 metres, 500 metres and 1,000 metres on a straight course. Up to nine kayaks or canoes can take part, each in a separate lane. Sprint Racers take part as singles, doubles and fours, paddling specialised canoes and kayaks. In canoes the competitors kneel and use a single-bladed paddle to propel the canoe. In kayaks the competitors are seated in the kayak and can use both ends of the paddle. Several London canoe clubs practice Sprint Racing, generally on the Thames in the west of London. The clubs place a lot of emphasis on training and fitness, making Sprint Racing a great way to get fresh air and keep fit. The London 2012 Olympic games Sprint Racing events took place at Eton Dorney in Buckinghamshire. Ed McKeever took Gold for Britain in the 200m K1 and Heath and Schofield took Bronze for Britain in the 200m K2. For more information on sprint racing please use the following links.